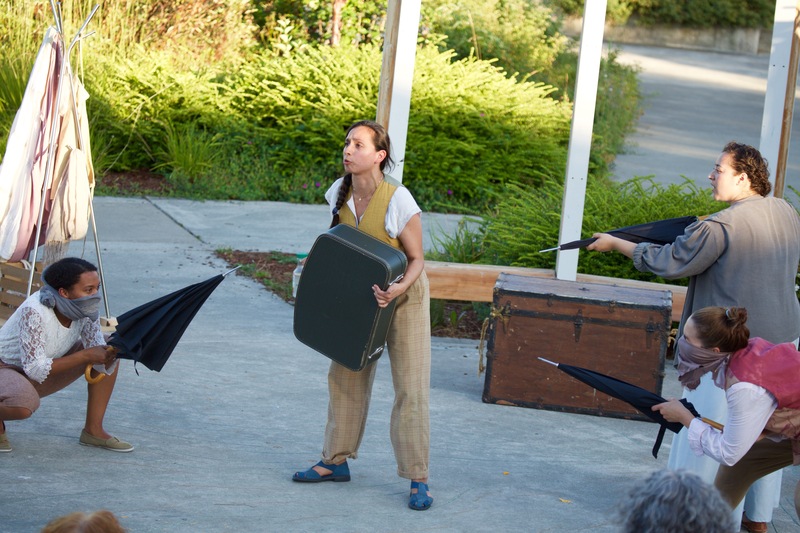 Last weekend, GreenStage’s Seattle Outdoor Theater Festival light-up Volunteer Park with a great amount of vibrancy. 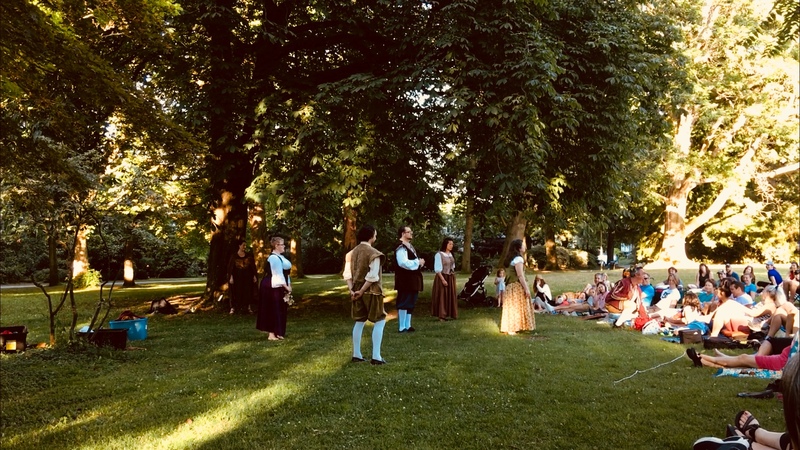 This festival featured performances of many Shakespearean and Shakespearean-inspired plays such as Twelfth Night, Henry IV part 1, and The Lost Folio. This festival has been performing annually since 2001, and was free of charge. The first two plays I had the chance of seeing while I attended the festival July 15th were The Two Gentlemen of Verona (TGV) and The Winter’s Tale (WT). Both these plays were performed by GreenStage’s all-female theater troupe Backyard Bard, and directed by Jennifer Crooks. 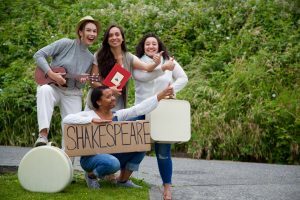 Backyard Bard is a heartfelt group of four talented actresses including Jordan Kerbs (Sister of the Dark Heart), Ashley Salazar (La Conejita Safe Space), Marena Kleinpeter (We Should Be Women), and Mimi Santos. Both these plays were directed with a feminist lense that highlights toxic masculinity, and the power of love and loyalty to save each other. Both the virtues of love and loyalty heavily influence the plot of both plays. In TGV Launce’s relationship to his shag dog Crab was a very endearing embodiment of loyalty that was delightful to see. Also, Seeing Paulina’s loyalty to her mistress Hermione that allows her to rise against larger patriarchal society and ultimately save the day in WT was very beautiful and lovely to see. One of the highlights from both these plays were the many great soliloquies. During each of the soliloquies within both plays, the actors addressed the audience as though they were speaking to the audience while being lost in thinking out loud and high-off passionate emotions. Another highlight of TGV was the bandit scene which was full of liveliness and charisma. Other highlights from both these plays include kind and amazing scenes of audience interaction. These scenes of audience interaction included a man from the audience helping Proteus (Jordan Kerbs) serenade Julia. Another scene of audience interaction that was very heartfelt and lovely to see was a scene in WT where children from the audience volunteered to dance around an umbrella that had many ribbons attached (much like a Maypole) to sing-song tunes within WT. 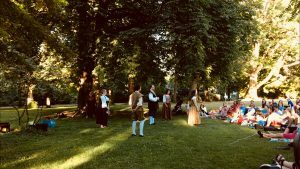 While attending the festival, I was also lucky enough to see The Lost Folio which is a Shakespearean inspired improv show performed by improvisers from Jet City Improv. At the beginning of the show, an improviser asked the audience a series of questions that shaped the show the improv troupe performed such as whether they would like to see a comedy or tragedy. As per audience request, the improvisors performed a Shakespearean tragedy that featured witches, a wedding, royalty (i.e kings and queens), pineapples, a woman named Lady Sonicare, and many bloody deaths. 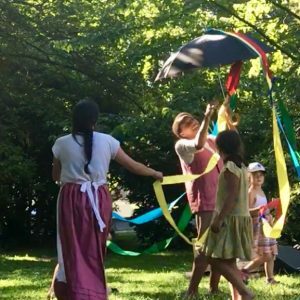 Being that GreenStage’s mission is to make theater more accessible, fun, and recreationally enjoyable to all, I think that their festival was a hit! Many of the shows featured at this festival will also be performing nearby throughout the rest of the summer. You can find out more about upcoming performances, and support GreenStage’s wonderful work by visiting http://greenstage.org/.